Sled training is and has been a solid athletic training method for quite some time. 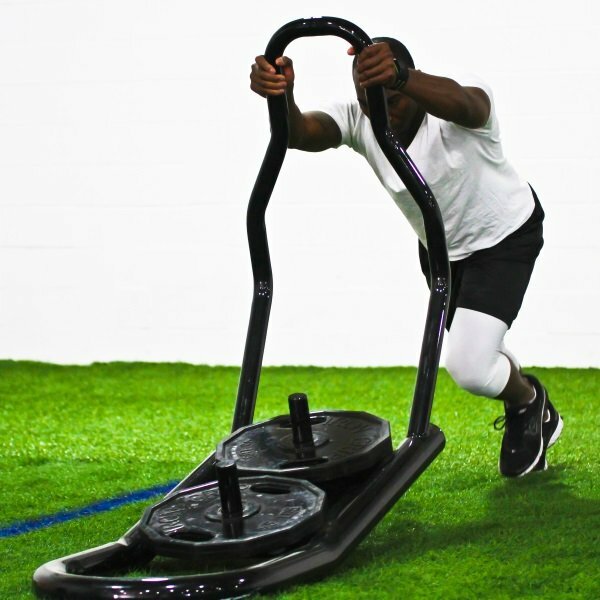 Whether you use a light or a heavy load, sled training can improve your sprinting technique and acceleration so you can operate faster on the field. Sled work is also a great method for improving anaerobic endurance. It’s “concentric” dominant, and it can help reduce muscle soreness, facilitate recovery during certain phases of a training cycle or season, and improve other athletic training attributes, according to research. Below I discuss five variations many of you may be familiar with; but the rationale behind why they are implemented may provide some unique insight for you as an athlete or coach. Marching is a useful beginner exercise for athletes who are unable to exhibit the body posture and technique required for a faster and more complex sprint pattern. Slowing down, feeling and verbally cueing what they need to do to move correctly is sometimes warranted and can fix several issues. Specifically, marching engrains front and backside mechanics, stance leg stiffness, vertical and horizontal force production, forefoot dominance, and more—all of which regulate performance with the sled and in a sport setting. Sled Pulls were first introduced to me by Joe DeFranco in an article he wrote several years back. You can detect a lot of value right away with this exercise. First, there is a natural tendency to want to rotate. Although a slight degree of rotation is allowed and was present with sprinters in research, a critical mistake is to rotate too much, causing deceleration. This is due to the fact that the rotary core system is weak and unable to offset the powerful response from the arms driving back and forth. Also, the hips and legs may be too weak, so athletes compensate with the torso to drive more energy into the rep.
By removing the arms from the movement, you balance the forces generated from your lower body and must engage other areas (e.g., the core) to stay balanced. Other benefits of this exercise are its increased demand on the lower body, and greater body angle to help encourage increased horizontal force production and hip strength, which many athletes often lack in movement. Once an athlete becomes proficient in performing the previous two exercises, it’s time to introduce a standard Sled Sprint. It will develop higher levels of specific strength in all of the involved musculature, in much the same way that they are called upon to function during the initial stages of accelerating in sport or competition. I love the Crossover Run for my athletes! Over the years, I’ve noticed that if you pick movement patterns with a specific directional focus (e.g., linear, lateral, rotational, combo), the lateral direction, or frontal plane, seems generally to be the weak link. Whether the weakness is attributed to a “knocked knee” structural alignment, or whatever, athletes regularly struggle to land, jump and sprint in this direction, and the Crossover Run can help cure this deficiency along with several other training strategies. The Sled Bound evolved from traditional Bounds or Leaps, adopted from track & field culture and applied to team sports that depend more on acceleration than top speed—although top speed is important for various reasons. If you want learn more about this topic, check out this article. Specific to acceleration, stride length and power are major weaknesses in many athletes, which Sled Bounds naturally work to resolve. In the second installment of sled training for athletes, I will introduce and review five more variations that you can integrate into your programs, along with some potentially new information. I will also share a few programming options so you can make sure that sled training is sequenced properly in your workouts, and so that you receive the biggest bang for your buck in pursuit of the specific training goals you set for sled training.